No question about it, no matter how many times I see it, “How the Grinch Stole Christmas!” makes my brain malfunction every time. “How the Grinch Stole Christmas!” is 26 minutes of pure retina-wrenching, adrenaline-pumping color combinations. Sure, the tale is rich with imagery of seasick crocodiles and three-decker sauerkraut and toadstool sandwiches with arsenic sauce. And the story’s heartwarming conclusion is a classic. What really interests me, however, is the kaleidoscope of colors happening in practically every scene. The film’s approach to color alone is enough to make any misanthrope believe in the good of humankind! Is there anything like the town of Who-ville, seen from the slopes of Mount Crumpit? Can sense be made of how the magenta-washed houses of the Whos take on a purple tincture in the dim shadows of night? Can words adequately describe how the Grinch, in his limegreen glory, casts a bilious aura upon everything that surrounds him? Last time I viewed the movie, 25 scenes caught my eye. Next year, another set of totally different scenes may interest me. 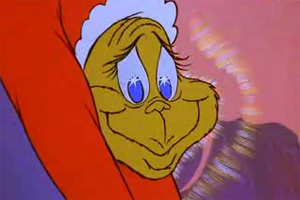 Every time I watch “How the Grinch Stole Christmas!” the movie rings true and anew. Just two minutes before the close of the film, we witness the Grinch careening down Mount Crumpit, with Max in tow, with the glowing morning sun of Christmas day intensifying in the sky. Here, yellow, purple and brown come together in an dizzying onrush. The irony: The Grinch’s Christmas transformation is portrayed in completely un-Christmaslike, complementary colors! The Grinch and Max begin their descent down Mount Crumpit. As their descent continues, a rocky background alternates with blue trees, producing a visual rhythm. The Whos’ fantastic élan for interior decor exemplified. Who-ville on Christmas morning, seen from Mt. Crumpit. The Whos join into a circle on Christmas morning. Bells ring in the center of Who-ville. What’s going on with that crazy lapel — whatever it is? On that note, I wish you a fabulous holiday. See you in the next decade! Where do I get my ideas for painting and color? Like many artists, I’m sure, I find inspiration from just about anything. I never know what will inspire me to create my next painting — and color is often source of my inspiration. Right now, a textbook I enjoyed as a first-year in college is inspiring me. 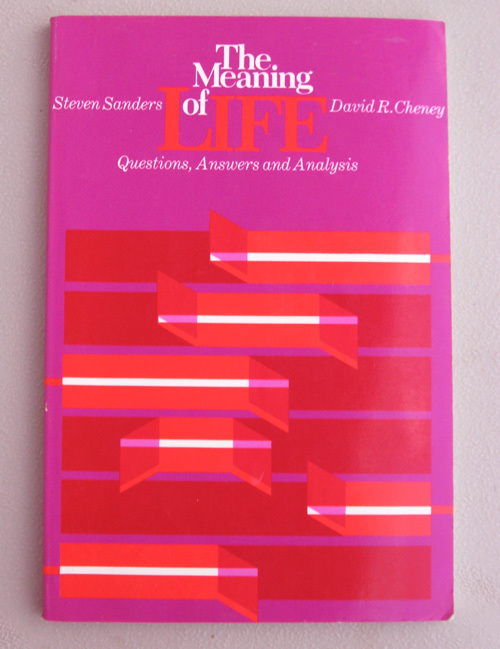 The book is titled The Meaning of Life: Questions, Answers and Analysis, edited by Steven Sanders and David R. Cheney. In school, the chapter titled “Nothing Matters” really resonated with me. Today, it’s the book’s cover, designed by Infield/D’Astolfo Associates. My next modern painting and color scheme are very much a tribute to this book’s jacket. 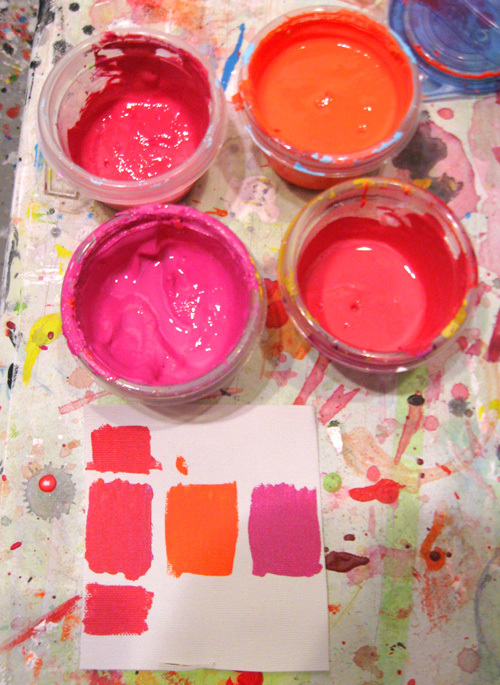 The intense clash of violet, ultrabright orange and white — and mixtures thereof — turn my eyes absolutely stark-mad crazy! Yet, as I modeled this on my computer, I found that I wasn’t thrilled with using white. Below, the first and second images are with white The third image eschews white altogether (Leave it to Verner Panton to talk me out of using white! 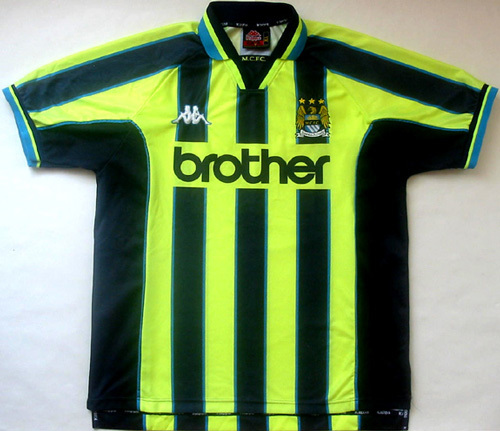 ), offering a variant of the second design. Of these three, do you have a favorite? Let me know in the comments below. I’d appreciate your feedback. All of this proves that, just like the meaning of life can be anything to anyone, inspiration for painting and color can be anything to any artist. The holidays have come and gone, and I look forward to getting back into the groove in ’09. Hanging out and celebrating and all that has been fun, but now it is time to get back to business, as if there were no time to waste! Amid the holiday downtime, I did find time to watch several episodes of the classic anime series Space Battleship Yamato (aka Starblazers). The first series was produced in 1974, and it offers hours of stellar outerspace illustrations and—my favorite part—mindblowing color combinations. I have found so much inspiration in this series. It is so completely outdated and anachronistic by contemporary standards, but I still find it amazing. And the background music for the first series is ineffably strange and beautiful. 2. Panton is quoted as declaring “Color is more important than form.” While I truly love line, I find a transformative power—almost a chemical reaction—in combinations of color. I’d have to agree. In closing, while I have written this before, I really do want to post to my blog with more frequency. Yet, I do find it difficult to find the time and energy. I don’t know why this is. Perhaps I should retroactively make “blogging more” my New Year’s resolution? If so, I guess I’m on my way to keeping it. Anyway, I welcome your ideas for blog posts. Random color combinations are an unfailing key to artistic inspiration. I’ve used everything from having an “art lottery” format — where I’ve assigned numbers to a chart of colors, and picked the numbers at random using a bingo drum (a long story!) — to using random.org’s random number generator to select CMYK values. 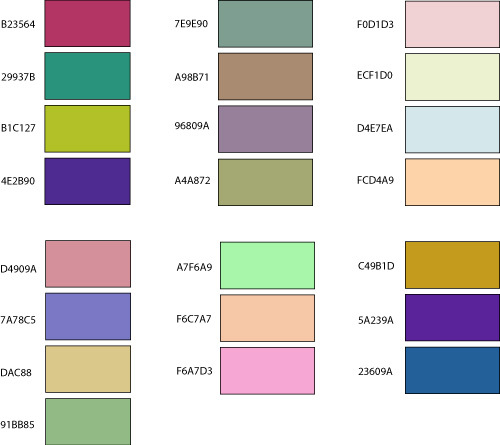 Last night I bumped into the ColorSchemer Studio software app, which is a nifty tool for building color schemes. It also has a randomize feature (exactly what I was looking for), which assigns groups of colors according to triads, tetrads, etc. After messing with the randomize feature for far too long, I have decided once and for all that random color combinations can’t always be trusted, because of the eye-irritant stuff that they yield most of the time. In the past, when I deliberately used multiple discordant colors in one painting, this randomization strategy could prove very handy. But now I prefer schemes that are more direct — I leave less to chance. While I have eschewed color randomization, I will say that I have very fond of an another app made by ColorSchemer — a free app, at that — called Color Pix. This tool lets you read the hex numbers & CMYK values of anything on your screen. Works great. Two of my newest paintings from the Motus series: Motus 006 (Suzani) and Motus 005 (Steel Wool). 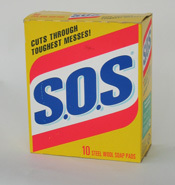 I based the former on a vintage box of SOS pads (See Fans of Vintage Packaging, Rejoice! 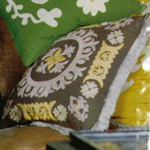 ), while the latter is a riff of a pillow from Anthropologie (below). 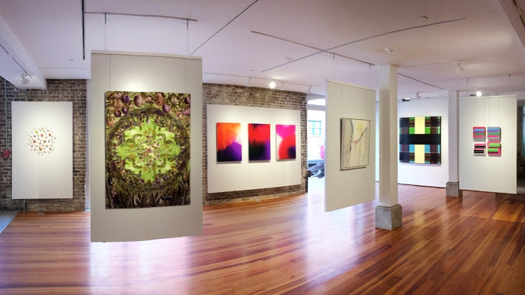 When it comes to art, color combinations can spring from anywhere. I enjoy interior design colors because they are typically colors that most people enjoy living with. (Go figure!) When I mix paints to match color combinations found in interior design magazines, I typically go in the opposite direction of what I gravitate toward. For Motus 006 — the aforementioned painting inspired by the Anthropologie pillow — I added 2 parts gray and 2 parts light blue to 10 parts titanium white; the mustard color is hansa yellow with a couple of drops of burnt sienna, a touch of mars black and lots of titanium white. 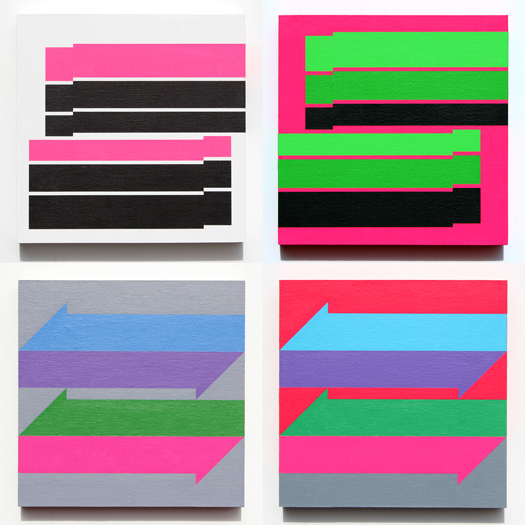 These art color combinations is very muted in a surprisingly wonderful way. These are interior design colors I normally wouldn’t mix. But I’m very happy with the outcome. 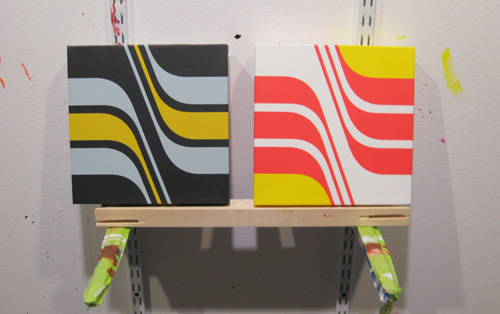 The Steel Wool piece uses the bold colors of packaging design: yellow, fluorescent red and white. It’s an eye irritant. I find inspiration in packaging and race cars for that reason. They’re all about grabbing your attention. Fluorescent colors are an easy choice. A race car is much easier to spot from a mile away when painted fluorescent orange. The next piece in the Motus series will feature the classic navy, red, and gold scheme made famous by Rothmans cigarettes — and the beautiful paint schemes on race cars and motorbikes that Rothmans sponsored for years. However, all things considered, interior design colors have a subtlety and gravity that racing and detergent box colors aren’t designed to employ. So I’m thinking about producing more interior design-inspired work in the future. Growing my palette a bit. An entirely mad gallery of mad Russian beer coasters. The site’s in Russian, which is all the madder to an English speaker like me! I have another friend who’s friends with one of the new American Gladiators. How utterly tough is that? And on that note, I feel like 2008 is off to a good start. Got some good painting in last weekend. And I have a few ideas for more pieces. Lookin’ forward to what’s ahead. The commute to work today offered a bumper crop of cool trucks to look at. Almost as if guided by destiny, I saw a Safety Kleen truck and a Mesilla Valley Transportation truck, side by side. What color combinations! In one lane, fluorescent-ish pea green, red, black, and white. 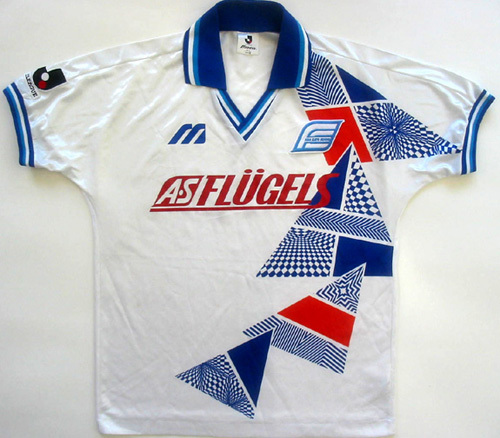 In the other, pearlescent blue, red, lavender, lime green, and white. That was cool. The New York Times offers an inspiring slide show of works by Karl Benjamin, which are on view at Louis Stern Fine Arts in Hollywood. A new BMW TV ad campaign surveys the car-maker’s history in kind of a random, desultory way. But nevermind the cars. The star is Roy Lichtenstein, who is shown painting his art car, which is glorious and inspiring. See video about the art car on YouTube. I was saddened today to learn about the passing of Robert Shields, who had an obsessive quest to document every moment of his life. He wrote a 37.5 million word diary. This got me thinking: If you’re always writing, all you have to write about the process of writing. The concept is fascinating, yet harrowing.